Male Mnesarchaea acuta, photographed by George Gibbs. 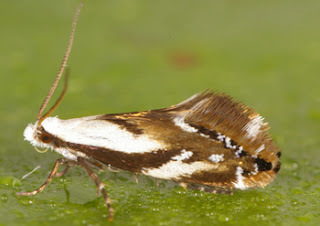 The Exoporia is a smaller but morphologically diverse group of moths, varying from the small Mnesarchaea to the large ghost moths of the Hepialidae. Nevertheless, the group is supported by a number of morphological synapomorphies, including a female genital system with separate egg-laying and copulatory openings, with sperm transferred externally along a furrow (Wiegmann et al. 2002). [AY04] Austin, A. D., D. K. Yeates, G. Cassis, M. J. Fletcher, J. La Salle, J. F. Lawrence, P. B. McQuillan, L. A. Mound, D. J. Bickel, P. J. Gullan, D. F. Hales & G. S. Taylor. 2004. Insects 'Down Under' - diversity, endemism and evolution of the Australian insect fauna: examples from select orders. Australian Journal of Entomology 43 (3): 216-234. [DS73] Dickens, M., & E. Storey. 1973. The World of Moths. Macmillan Publishing Co., Inc.: New York. [D49] Dumbleton, L. J. 1949. Diplocystis oxycani n.sp. - a gregarine parasite of Oxycanus cervinatus Walk. Transactions and Proceedings of the Royal Society of New Zealand 77 (4): 530-532. [G01] Gibbs, G. W. 2001. Habitats and biogeography of New Zealand’s deinacridine and tusked weta species. In The Biology of Wetas, King Crickets and Their Allies (L. H. Field, ed.) pp. 35-55. CABI Publishing: Wallingford (UK). [H74] Helson, G. A. H. 1974. Insect Pests: Identification, life history, and control of pests of farms, horticulture, gardens, and public health. A. R. Shearer, Government Printer: Wellington (New Zealand). [JP05] Jungmann, E., & U. Poller. 2005. Neunachweise und Wiederfunde für die Schmetterlingsfauna (Insecta; Lepidoptera) des Altenburger Landes. Mauritiana 19 (2): 317-326. [P27a] Philpott, A. 1927a. New Zealand Lepidoptera: Notes and descriptions. Transactions and Proceedings of the New Zealand Institute 57: 703-709. [P27b] Philpott, A. 1927b. The genitalia of the Mnesarchaeidae. Transactions and Proceedings of the New Zealand Institute 57: 710-715. [P27c] Philpott, A. 1927c. The maxillae in the Lepidoptera. Transactions and Proceedings of the New Zealand Institute 57: 721-746. [WRM02] Wiegmann, B. M., J. C. Regier & C. Mitter. 2002. Combined molecular and morphological evidence on the phylogeny of the earliest lepidopteran lineages. Zoologica Scripta 31 (1): 67-81.